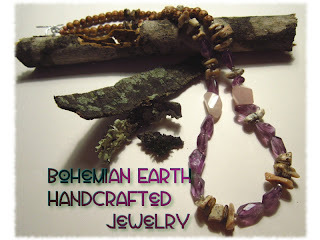 Bohemian Earth: Handcrafted Jewelry: Holiday Sale! 30% Off! It's been a quiet year for me at Bohemian Earth! Blame it on major life upheavals, dissertation writing, teaching, being the managing editor of a peer-reviewed scholarly journal, and many other responsibilities! I've had a few small projects, but many of my creations have remained on the drawing born waiting to be born! I hope to be able to have more creating time next year as I will have a little less on my plate. Alright, now to the good stuff! I'm having a holiday sale to celebrate the year and the season of winter holidays! Here's the deal: everything in my Etsy shop will be 30% off—including sale items! Just use the code HOLIDAY13 at checkout valid 11/30-12/3/13. Ready-to-ship items will ship no later than 12/4/13 and made-to-order items will ship out by 12/10/13 depending on order volume. If you have a mixed order, it will ship out by the later date. Feel free to ask me any questions! May you have a lovely winter holiday season! These pictures link to blogposts!